Digital display reads directly in kilovolts with 3-1/2 digits 1/2″ high on sharp contrast liquid crystal display. Readout is given to the nearest 10 volts. Example: a 12,470 volts system, phase to phase, would read 12.47 on the meter. The digital display has a lighted background which can be switched on by operator, if needed, during use in poor light conditions. The meter is sold state design and eliminates problems associated with analog type meters. The unit is powered by a readily available 9-volt battery and is field replaceable. Low battery condition are indicated on the display. The coiled, self-retracting cable is 16″ retracted and 10′ when fully extended. This design simplifies the use of the instrument. Compact storage is provided by a rugged plastic case which can also accommodate a pair of add-on resistor extensions. The meter and coiled cable is attached to two 1-1/4″ diameter x 12″ long fiberglass sticks. Female universal splines are provided on one end to allow attachment on all universal hot sticks. One conductor hook 2″ diameter and one 2-1/2″ straight probe is provided on other ends. 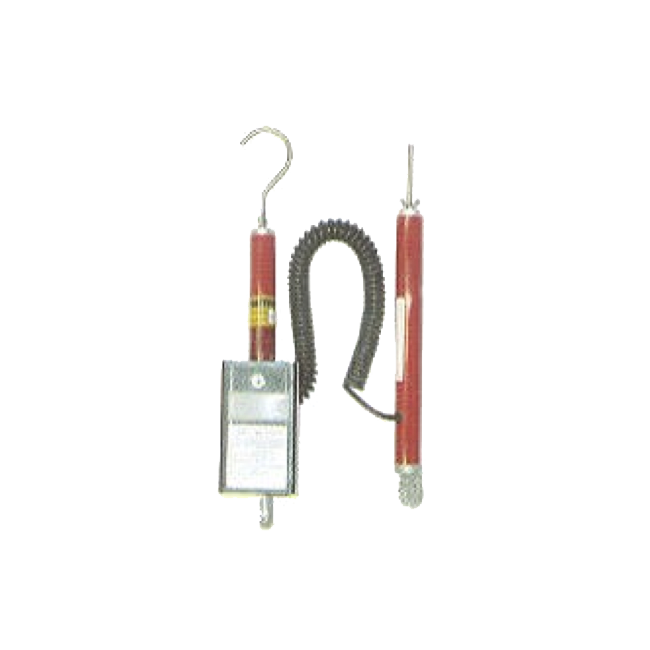 With use of add-on extension resistors unit can measure voltages up to 80 kV. CPPM-6706 – 0-20kV Digital Volt Meter w/conductor hooks. Unit comes complete with carry case battery and instructions. – 5.0 lbs. CPPM-6712 – Pair of Extension Resistors to increase operating range. – 1.0 lbs.